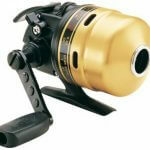 Durable Daiwa Goldcast reels offer quality spincasting at an affordable price. Reels have an oscillating spool level wind for a smooth spincast drag, and a ball bearing drive for even retrieves. Rugged metal body and nose cone provides durability. Reel also has an on/off anti-reverse for solid hooksets and a strong, oversized stainless steel line guide. Each reel has a rotating tungsten carbide line pickup pin and each comes wound with premium line.